Posted on January 28, 2016 at 12:27 pm. If you’re not a registered player at Guts.com, there’s never been a better time to sign up, with Guts extending 20 free spins on NetEnt’s King of Slots pokies game – no real money deposit required. This means that just by signing up for an account, which only takes a couple of minutes and only requires the most basic contact information, you’ll be granted with 20 free spins that you can use to potentially win cash for no risk to your own bank account. The free spins are set to expire on January 30th, so head to Guts.com today to make sure you don’t miss out. Just click our links to sign up, then find King of Slots using the simple game filter and load the game to receive your free spins. King of Slots is a quirky NetEnt creation featuring three lines, five reels and 25 paylines. It uses classic slot machine symbols like crowns, gems, cherries, lemons and watermelons, but with a bedazzled makeover that makes for an eye-catching game. 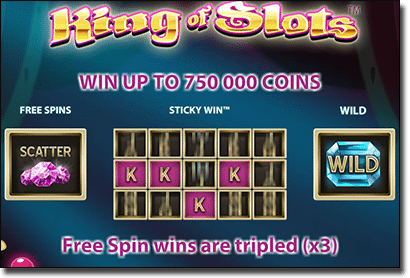 There are several lucrative features in King of Slots, most notably a jackpot of up to 750,000 coins, a free spins bonus round that triples all wins and NetEnt’s exclusive Sticky Wins feature, where any winning symbols are held in place while all other reels re-spin for the chance to land bigger wins. High rollers will also be happy, with King of Slots offering a maximum bet of $250 per spin. Guts accepts deposits in Australian currency, with several secure payment options available like Visa, MasterCard, Neteller, Skrill, and Paysafecard. The site is protected by advanced digital SSL (Secure Socket Layer) encryption, making it a safe place for Aussie players to play for real money pokies online. Click here to sign up at Guts.com and receive 20 free spins on King of Slots for a limited time only.